Production of Fruit juice with enzymes is an essential practice in the juice industry throughout the world, and apple juice is the most popular juice over all. To the average person, fruit juice production is a simple concept, just squeeze and collect the juice. As with most things, the process is much more complex, especially when processing several tons of apples at a time. Other issues such as increasing yield, controlling clarity with enzymes, sweetness and shelf life are all important factors for juice processors. Therefore, manufacturing fruit juice in a cost effective manner requires significant technical expertise at every step in the process and that is where Specialty Enzymes can help. There are many variables to consider. These range from choosing the right kind of press to how early harvest apples differs from late harvest or stored apples. Other issues include how to maintain a consistent level of sweetness and rate of clarification, through enzymes, in the clarification tanks. Every step possesses the necessity to use fruit and juice processing enzymes. Enzyme Use in The Mash:From the washers, the apples are chopped up by a grinder, apple mill or a hammer mill and turned into apple mash. To produce a highly pressable mash, it should not be ground to fine, stirred or heated above 35 C (95 F). When treated with PECTINASES the temperature range is kept mild, from 20 – 30 C and the reaction and the reaction time is typically 30 – 120 minutes. This is in part to limit the hydrolysis of protopectin. Protopectin binds the cells and its hydrolysis weakens the fruit tissue, reduces its pressability and increases viscosity. The addition of PECTINASE to the mill is very beneficial especially for apples with a soft texture. PECTINASES developed for apple mashes contain a high percentage of pectin esterase and polygalacturonase (aka pectin glucosidase). These enzymes dramatically reduce viscosity and the stickiness of the pomace without affecting protopectin or reducing its pressability. Enzyme blends that include CELLULASE andHEMICELLULASE activity can break down the cell wall and increase the over-all juice production by 5 – 10 %. The mash is then sent to hydraulic presses that squeeze the mash to extract the juice. 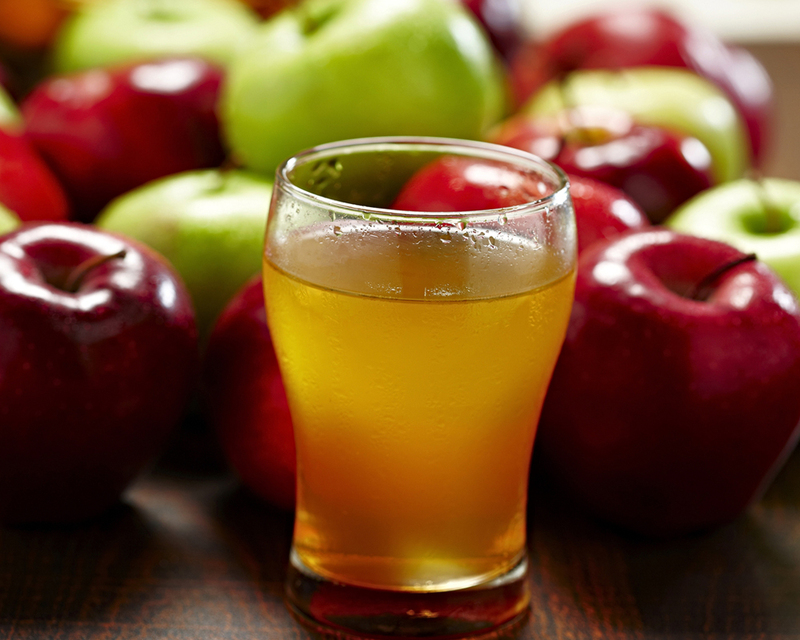 A single press usually yields only about 60 – 70% of the juice from fresh apples. Stored apples produce less juice and their untreated pomace tends to stick to the press. This is caused by protopectin hydrolysis that occurs during ripening, which separates cells and softens the fruit. Water is added to the pulp reside and it is completely expressed, usually with a horizontal press. The increase in juice volume isn’t great but the increasing sugar is significant. Normal juice is about 12 Brix. The second press sugar can raise the juice to 12.3 – 12.5 Brix. The apple juice is then pumped into holding tanks where it is filtered to remove sediment. If PECTINASE was not added during mash, it can be added to the holding tanks. The use of a product like LiquiSEB or ClariSEB will reduce viscosity, prevent or reduce clogging of the filters and increase filtration rates. If LiquiSEB was used during the mash, ClariSEB enzyme could be used to clarify the product and to further reduce viscosity.